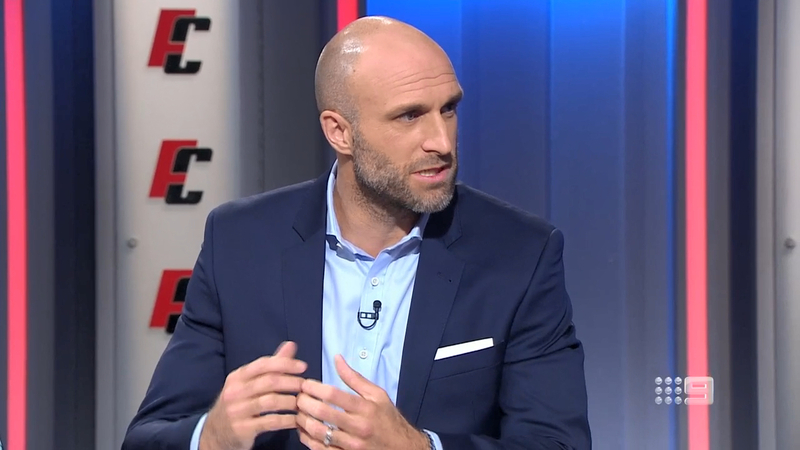 AFL greats Chris Judd and Matthew Lloyd have clashed over Dustin Martin's crude gesture at the weekend after Judd suggested he wasn't offended by the incident. Speaking on Footy Classified, Judd stated that while Martin's actions were "mildly stupid" the AFL should not fine the 2017 Brownlow Medallist. "I personally don't take offence to it," Judd said. "It's a stupid thing to do but it adds a bit of colour. I don't know if it's going to be a weekly trend. "We talk about the players becoming vanilla and there's not enough characters in the game." However, following Judd's surprising assertion regarding Martin's actions, Lloyd chimed in and asked the two-time Brownlow Medallist on the children's perspective which ensued in a back and forth between the two. "My son could've asked me why wasn't Mumford playing in the first two rounds," Judd replied. Lloyd: "What about the look of the game? I'm speaking for the kids of the game." Judd: "You're not elected to speak for them. You're just speaking for yourself." The past two weeks have caused Martin's form to come under the spotlight and Lloyd suggested that Tigers coach Damien Hardwick had to question his star midfielder. "I felt like this was brewing and it doesn't come as a major surprise what happened on the weekend," Lloyd said. If I was Damien Hardwick, I'd ask Dustin Martin these questions: Are you as fit as you were? Are you running two-ways as hard as you were a few years back? Your training standards, where are they at? Where are you at mentally? "I'm questioning all those things with Dustin Martin at the moment." Even prior to the injuries to Alex Rance and Jack Riewoldt, the Tigers have looked less explosive compared to previous seasons and Judd suggested that Hardwick's game-plan had become outdated. "You look at the foot skills of teams like West Coast and Collingwood where they just don't give an opportunity to tackle," he said.